An animation showing a comparison between the confirmation image of supernova in M82 by the team from the Remanzacco Observatory and archive image by a 2-meter telescope FTN – LCOGT from November 22, 2013. Click on the image for a larger version. Credit: E. Guido, N. Howes, M. Nicolini. Astronomers are saying this new supernova is currently at magnitude +11 to +12, so its definitely not visible with the naked eye. You’ll need a 4 inch telescope at least to be able to see it. That said, at 12 million light years away, this is (at the moment) the brightest, closest supernova since SN 1993 J kaboomed in neighboring galaxy M81 21 years ago in 1993. M81 and M82, along with NGC 3077, form a close-knit interacting group. It’s amazing it wasn’t found and reported sooner (update — see below, as perhaps it was!). M82 is a popular target for beginning and amateur astronomers; pre-discovery observations show it had already brightened to magnitude 13.9 on the 16th, 13.3 on the 17th and 12.2 on the 19th. Cold winter weather and clouds to blame? This is the starburst galaxy M82 imaged by Hubble in 2006, with approximate location of the new supernova noted. Image credit: NASA/ESA and the Hubble Heritage team, image notation by Jason Major. M82 is a bright, striking edge-on spiral galaxy bright enough to see in binoculars. Known as the Cigar or Starburst Galaxy because of its shape and a large, active starburst region in its core, it’s only 12 million light years from Earth and home to two previous supernovae in 2004 and 2008. Neither of those came anywhere close to the being as bright as the discovery, and it’s very possible the new object will become brighter yet. PSN J09554214+6940260 is a Type Ia supernova. Type Ia (one-a), a dry term describing one of the most catastrophic events in the universe. Here a superdense white dwarf, a star only about the size of Earth but with the gravitational power of a sun-size star, pulls hydrogen gas from a nearby companion down to its surface where it adds to the star’s weight. When the dwarf packs enough pounds to reach a mass 1.4 times that of the sun, it can no longer support itself. The star suddenly collapses, heats to incredible temperatures and burns up explosively in a runaway fusion reaction. What we see here on Earth is the sudden appearance of a brand new star within the galaxy’s disk. Of course, it’s not really a new star, but rather the end of an aged one. I know you’re as excited as I am to get a look at this spectacular new star the next clear night, so I’ve prepared a couple maps to help you find the galaxy. The best time to see the supernova is as soon as the sky gets dark when it’s already up in the northeastern sky above the Dipper Bowl, but since it’s circumpolar for mid-latitude observers, you can check it out any time of night. My maps show its position for around 8 o’clock. When you dial in the galaxy in your telescope, look for a starry point along its long axis west and south of the nucleus. All the fury of this fantastic blast is concentrated in that meek spark of light glimmering in the galactic haze. Good luck and enjoy watching one of the biggest show of fireworks the universe has to offer. We’ll keep you posted with the latest updates right here. For more photos and additional information, please see David Bishop’s excellent Latest Supernovae site. For charts with magnitudes to follow the supernova’s progress, visit the AAVSO’s Variable Star Plotter and type in ‘PSN J09554214+6940260’ for the star’s name. You can read more about the followup work by the Remanzacco Observatory team here. Screenshot from the January 19 Virtual Star Party (right) compared to image from Meineko Sakura of the Tao Astronomical Observatory of the new supernova. This article is confusing. Is the supernova in M81 or M82? I’m headed out to my dark sky site…haven’t seen a supernova since M51 went off! 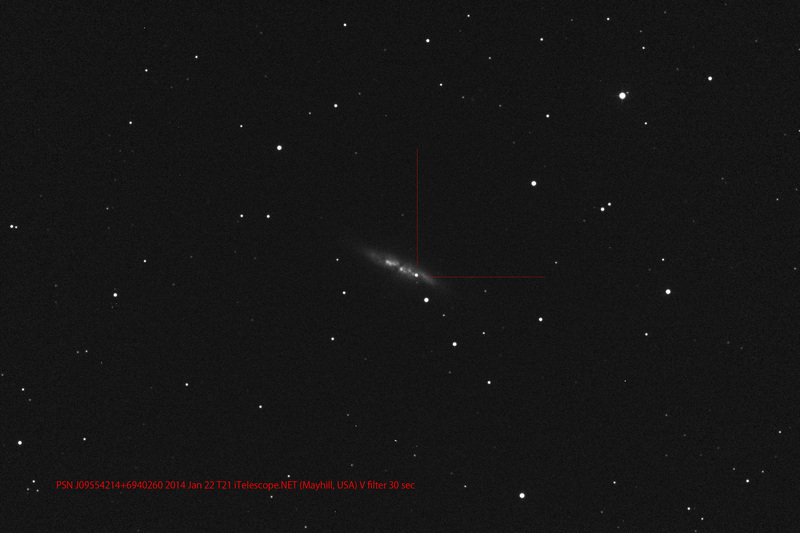 I think I also caught it…I was out just testing out equipment and decided to image the M81/M82 pair. I have both single frames and a stack from 6:25 UT on 1/20. (00:25 CST). Cool! Supernova explosion in M82, the cigar galaxy, eh? Further scientific evidence that smoking is hazardous to your health. Yep, You guys imaged it, Congrats! Always find M81 a difficult object in my fork mounted 4″ Meade SCT. Any tips?/tricks? It’s so close to the pole that the telescope turning in ever tighter radius is then harder to intuitively navigate? And you can forget about putting most cameras on when pointed anywhere near Polaris..
Is that what you call close, Bob? Ah, M82. Bill Clinton’s favorite galaxy. Would u need a dark sky sight to see it in 10×50 binos probably (and M81)? How gutted is everyone who watched the star party that they didn’t notice it! Can someone please explain how the supernova (or the light from it) could grow so much relative to the galaxy in just a couple of months? Not months, days. Look at old newsreels of the Bikini H-Bomb test flash, then think of something a gazillion times bigger. But are we seeing ‘just’ the fireball, or are those angry photons already lighting up nearby gas for us? Anyone know? Its not fusion…..its electric. What youre watching is more or less and arc….sustained. Just like a welders arc but on a massive scale. Energy flows through the universe on invisible plasma currents…sometimes, those currents are disrupted and that’s when we see an arc. Well, I would say that since we can study the supernova directly, astronomers won’t have to use the indirect gas cloud trick to see its spectrum. And since this supernova will probably only last months, there would be only a very narrow window when it could be seen. But you never know. It all depends where the gas cloud is. Imagine a hydrogen bomb 1.4 times the size of the Sun in a cosmic pressure cooker and then the lid blows. To add to the below, it’s not growing that much at all, compared to the galaxy. To put it succinctly, galaxies are FREAKING HUGE. For a star to explode and take up roughly .5% of its visible scale would probably require more energy than that star and it’s nearest 10,000 neighbors have ever (or would ever) output in their entire existence. That would mean an explosion on an impossibly massive scale and is astronomically improbable. Cameras measure and record in relative brightness. The same way you get glare by looking through a dusty windshield in a car, the cameras on these telescopes are picking up light not only from the supernova itself, but diffused light from interstellar dust and particulates. So, on top of the nova itself, now the camera is picking up added reflected light. Compared to the nova, though, that amount is negligible. The greater reason is its brightness relative to the galaxy. It temporarily overexposes the image and gives the star a larger visible aura (for lack of a better word). That happens in the exact same way a very bright object against a dark background will give you a strong bloom effect under bright lighting. If you were able to anticipate the supernova (somehow) and turn up the camera’s exposure threshold especially for it, it would appear to be insignificantly bigger than the stars around it. At the same time, however, you would only be able to see the absolute brightest objects in that photo, because raising the exposure threshold means occluding all but the brightest light sources. If you’ve ever been driving at night and suddenly had an oncoming car’s headlights temporarily blind you, it’s for the same reason. Your eyes have essentially lowered their exposure threshold and thrown the shutter wide open so they can gather as much light as possible; but now you’ve gone and shone a properly bright light into them and they’re screaming. The light is only about 4″ x 6″, but it now fills your entire field of vision. It’s identical, in principle. motorway (Freeway) not far away. outside the place looking like road-facing LEDs, though. What news from the IceCube polar neutrino observatory? Ah, just found this in New Scientist..
Great blog… Question, might seem stupid but astronomy is not my area. I picture a beam of light as synonymous to a stream of water. Assuming all the constants, if the event occurred 12 million light years away. If the light recently reached the earth, can we not assume the event occurred 12 million years ago? Anyone else struck by how awesome the universe is, and small we are? You can asume that, yes. I find it quite fitting with the resent passing of John Dobson….he would have loved this. Are there any correlations to M82 X-1? The SIMBAD database, the most up-to-date one I know, gives the coordinates of M82 X-1 as 09 55 50.2 +09 40 47. This looks to be, as one would expect, the galactic center. which are 09 55 42,14 +69 40 26. So between 25 & 30 arc seconds of arc away. At 12 million light years from us, that’s not a hop and a skip. So the short answer is, very probably no connection at all. The SN is a white dwarf with fatal indigestion, pure and simple. Thank you very much for looking that up @anthonyfowles:disqus. Has anyone seen a prognosis for the brightness curve of this SN? The weather in Europe is expletive deleted until at least Tuesday next week. Am I right in thinking that Type 1a SNs are visible (from my backyard that means mag 10.5 or brighter) for longer than Type 2s are? The Finnish guy, who recognised it several days earlier, simply went to his local Finnish-language Astronomers’ Forum and told them. So if you want dozens of Twitter followers and your 15 minutes of fame, you now know what to do. If on the other hand you just want your peace and quiet, do what the Finn did. The animation is really bizarre– it shows several different stars brightening dramatically. Clearly, the exposure settings differed! It’s not a really good way of showing the supernova at all.